When the images began showing up you just knew they had a kind of signature to them. 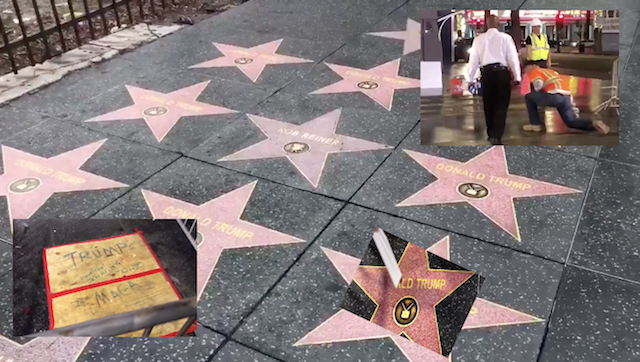 It turns out the anti-establishment, anit-PC, pro-Trump republican street artists The Faction and Sabo are behind copies of Donald Trump’s Walk of Fame star popping up all over the Hollywood Walk of Fame around Leftists stars like Rob Reiner, Jimmy Kimmel and pervert Kevin Spacey. Leftists need to understand half the country doesn’t agree with them and we’re tired of the tantrums, hate, LIES, bullying and assaults. The message here is clear, the more the Left pushes the harder Normals are going to push back.